Bollywood’s superstar Shah Rukh Khan celebrates his 51st birthday today and the actor took his fans by surprises by appearing on his bungalow, Mannat’s balcony. Last night, Shah Rukh Khan along with his close friends and family moved to Alibag for birthday celebrations. Fans were quite disappointed about SRK not being in Mumbai to greet them as he does every year. But hold on, SRK never disappoints his fans! 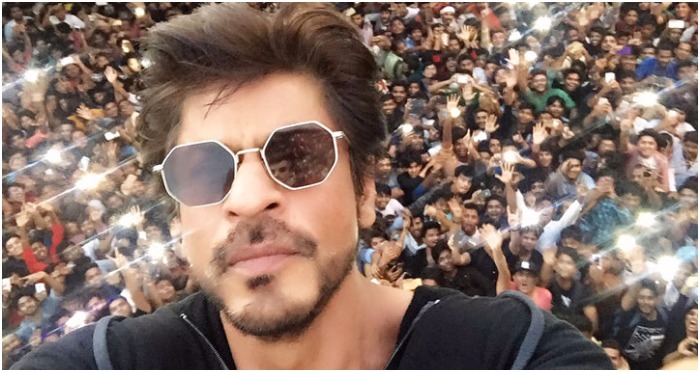 Like every year, this year too Shah Rukh Khan greeted his thousands of fans, who had gathered outside to wish King Khan on his birthday. Dressed in black zipper jacket and military pants, SRK waved and thanked his “Jabra” fans in his patent style, leaving crowd crazy. Shah Rukh Khan has conquered our hearts and one can’t deny the fact that he is truly the “King Khan” of Bollywood. Here’s wishing Badshah a very Happy Birthday!